“Your Honor” Corporate Painting is a 30″X38″ legacy painting of former Chief Judge was unveiled November 9, 2009. 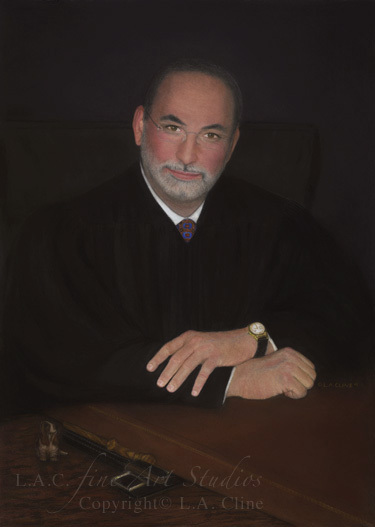 “Your Honor” Corporate painting was added to an already existing collection as the twelfth portrait of the Third District Court of Appeal Courtroom. The last portrait to be created for this courtroom was in the 1950’s. The Chief Judge was seated at his desk in a very natural position. In the evening his desk is cleared of all work so when the morning begins everything starts anew. If you look closely at the watch it has a time of 8:30am. This is the start of the day. There are other very exciting details in this “Your Honor” corporate painting that bring out the personality of the subject. The colors in the tie represent the Florida Gators colors and the hound dog figurine on the desk is a part of an extensive collection. The background is a deep rich palette that gives the painting a sense of bold strength. The subject’s beard and glasses are very modern stylish details. The framing was just as exquisite surrounding the 30″X38″ “Your Honor” Corporate Painting. Framing the art with a Black and Gold subtle wide five inch frame with gold caving around the outer edge suggested the strength and power of his position in the court.